Which Way Do You Say? The first time a giraffe wandered across my line of vision, I was hunkered down in a hide at a Bushveld waterhole. Because hides are designed to hide the watcher (go figure) from the watched, it’s all a bit of a cheat. Small openings are typical of a hide (to see and not be seen) and they enhance the atmosphere of suspended reality. It’s like watching an old TV in a dark room. With the palm leaf roof and thick reed walls dulling the natural sounds of the bush, reality fades. But eventually, all that time on the hard wooden planks, melting in the warm gloom, pays off as animals make their way to the water for the evening drink. So, after a few days of game viewing, you think you can’t be surprised anymore. I have news for you; think again! Don’t get blasé! 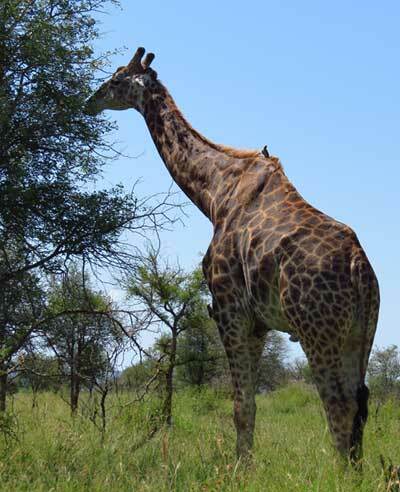 The next time I saw giraffe, we were spotting wildlife from the back of a 4×4 – no sides! Only the canopy and open air separates you from an ENORMOUS animal. The effect is all the more dramatic because the highly decorative, flashy coat up-close is the equivalent of watching HD movies on the big screen from the front row. Really in-your-face! Only this animal, you can see and smell! I’m sure I could hear his stomach gurgling, but hey this is me… excitement gives my brain all sorts of highly dramatic, special effects! Whew, what a relief. At least I’m not going to be stepped on, not this time. This truly remarkable creature wandering past the Land Rover isn’t even mildly curious about us… Nope, we’re just something (a rock, an anthill, a pile of scrap metal?) on the way to those tasty Acacia trees over there. 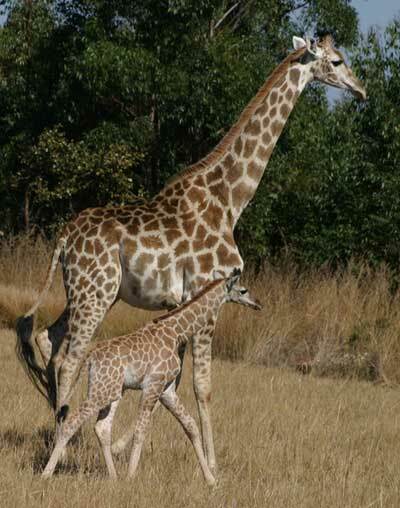 Had there been any suspicion of danger from us, we may have had to watch out for those hooves – the size of a Frisbee – a giraffe mama’s greatest weapon against threats to her baby! Roughly, half of all baby giraffe become the victims of predators such as lion or hyenas in the first year of life anyway. But no mamas here; the three animals passing by are all males. The males have different tactics though. 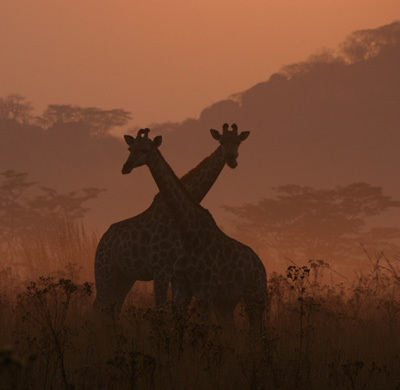 Top Giraffe is achieved by battles called ‘necking’ between the guys. They throw their weight around, well more like their head (up to 25 pounds, about 10 kgs) with protrusions (ossicones), on the end of those incredibly strong necks. Usually these battles end when one opponent walks away, exhausted; effectively ending the contest. But let’s get back to this size business. Did I say these animals are big? This group of males wandering past are seriously huge and this one, closest to the vehicle, is just legs, can’t see any stomach. I’d have to stick my neck out (pun intended…sorry) from under the canvas canopy to see to the top of him – I’m not feeling that sparky today. The three giraffe drifted on by, moving with a rolling motion – ships on the Savannah sea, sailing serenely on to the next Acacia Island. Following this close encounter with my usual flurry of research, I come across plenty of interesting facts. Not unexpectedly, there isn’t a taller animal around; Giraffe males can reach 18 to 20 feet (5 to 6m) and weigh an average of about 3,500 pounds (1600 kgs)! Do you realize that’s 1.5 tons! A third of this is neck, a third legs and the remaining third makes for a lot of body. Collectively, they’re quite a calm species. When you think that they start life, being dropped about five feet on their heads by mama! Yup, giraffe give birth standing up! This sudden exit breaks the umbilical cord and the following thump shocks the baby giraffe into drawing its first deep breath. Despite the dramatic entry (uh…exit? ), this funny little baby will be standing up, all six feet of it, and walking only an hour or so later. Kilimanjaro Giraffe. You’ll Know Them by Their Marks. 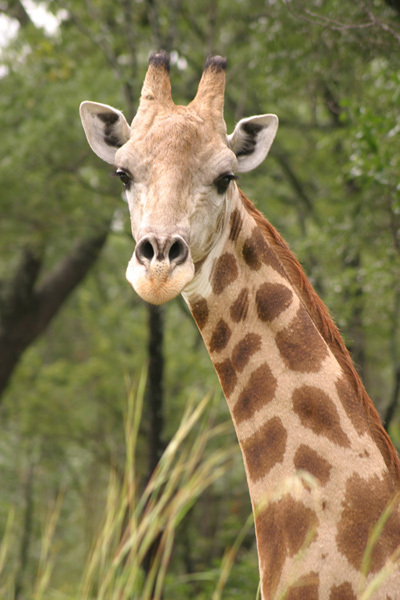 There are nine sub-species of giraffe found all over the African continent. Those members of the family in upper Africa have suffered more than their southern cousins from habitat loss and human conflict. Some of the subspecies are endangered; but generally, the whole species, like most African animals, suffers from reduced populations. For a list of the subspecies, the countries they populate and their conservation status, check Wikipedia. A giraffe’s big, brown eyes see the world in color and they have good hearing. They have a great sense of smell and for a party trick; the animal can shut its nose, keeping out irritating insects and the odd sandstorm. And to those remarkable attributes, add a tongue and top lip capable of grabbing onto leaves (prehensile). And since that tongue is really long, say about 20 inches, they even use it to clean their noses! All together now, Ewwwww! Oh and by the way, the giraffe has a black tongue. Why? Well some scientists say this is to protect it from sunburn. Do Giraffe Make a Sound? 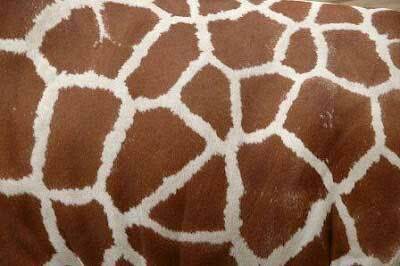 The inside of a giraffes’ mouth is lined with papillae, similar to our taste buds. These protect the mouth, including the lips and tongue, against thorns. This is a good attribute to have if you are going to eat all that yummy green foliage sprouting out of some serious thorn trees! They must get the odd thorn or two as they browse for the 75 pounds (34 kg) of food they need every day. 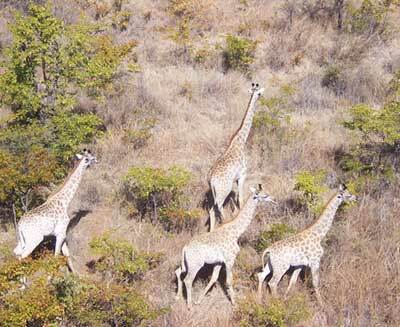 Although they can eat shrubs and grass, giraffe prefer specimens of Acacia, Combretum, Terminalia and Commiphora as these trees provide more protein and calcium. 1. They commonly sleep lying down. 2. Giraffe sleep about four and a half hours each day, mainly at night. 3. They chew the cud (Ruminate) – just like cows. 4. Because of moisture rich food, giraffe can go many days without drinking. 5. They are vulnerable to predators while drinking because of the awkward posture they must adopt to reach the water surface. 6. 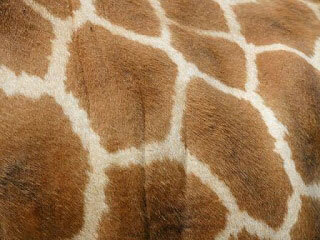 A giraffe’s very distinctive smell is caused by its fur containing natural parasite repellents. 7. 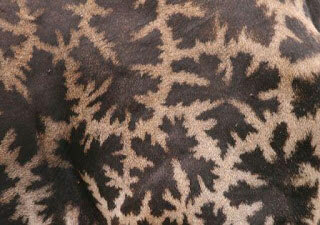 No two giraffe will share the same patterned hide, although animals from the same area can look very similar. 8. The giraffe is very quiet. So quiet in fact, scientists originally thought they were mute. Research has revealed they bleat, snort and grunt (very quietly) and like other large mammals (whales and elephants), they can communicate using infrasound. Also see this video, how man is using infrasound to protect our planet from being nuked. The team in the field do a lot of work with giraffe, and rhino, and hippo, and sable, and elephant, and buffalo and zebra and… There’ll be more here on Wildmoz soon, where along with true stories of life in Africa, we’ll reveal what giraffe and cooking pots have in common. Cooking pot? Yes, cooking pots! Who knew?